As of mid-afternoon, radar trends and atmospheric analysis indicate the cold front moving across Arkansas with a narrow band of thunderstorms over northeast Arkansas, a few briefly touching severe limits. Meanwhile, to the south, an upper-level disturbance has sparked an area of strong to severe thunderstorms over Louisiana, moving into Mississippi. These storms are expected to spread to the northeast for the remainder of the afternoon. Mid-day high resolution model data (click for loop of forecast precipitation from the HRRR) indicates that the storms to the southwest will move into north Mississippi and the Memphis area by early this evening as the cold front moves in from the west. This should result in a period of enhanced thunderstorm chances in the 7-10pm timeframe. The greatest severe thunderstorm chances should also occur during this period with the main threat being damaging straight-line wind with lower chances of hail and an isolated tornado. Prior to 7pm, showers and thunderstorms will remain primarily below severe limits and scattered in nature with very little activity expected before 5pm in the immediate area. After 10pm, expect shower activity to continue for a few hours, perhaps through 2-3am, as temperatures fall behind the front. Get the latest weather conditions and much more by checking out MemphisWeather.net on Facebook and Twitter! First, I believe the overall threat of tornadoes may be somewhat lower than expected yesterday. All of the ingredients, including the strongest dynamics and the greatest instability, don't quite seem to be phasing as well as I would like to see. This certainly does NOT rule out strong to severe thunderstorms capable of damaging wind or isolated large hail. In fact, I believe our main threat will be strong wind with storms near the cold front during the evening hours (see #3 below). Second, I do not believe we'll see a prolonged rain event in the Mid-South during the day today, and possibly not this evening. Showers and thunderstorms will tend to be more scattered this afternoon, with any steady rain most likely just behind the front for a couple of hours. I expect that rain will be moving out by the time the guitar drops on Beale Street, ushering in 2011. This does not hold true for areas east of the immediate metro area, where a slower progression of the front could mean more rain for eastern portions of west TN and north and central MS.
Third, I expect to see the metro area near the north end of a developing squall line during the evening hours (between 5-9pm). The strongest storms should be over MS, where the heaviest rain will also fall. This line of storms could produce wind gusts in excess of 50 mph, or near severe limits, as it passes through the metro area during the evening (or roughly between the final horn at the Liberty Bowl and New Year's Eve festivities really ramping up). Details and updated information will be available throughout the day on MemphisWeather.net, MWN on Twitter (@memphisweather1 and @shelbyalerts), and Facebook. A STRONG STORM SYSTEM MOVING INTO THE AREA TODAY WILL SET THE STAGE FOR A SEVERE WEATHER EVENT ACROSS PORTIONS OF THE AREA. A WARM FRONT POSITIONED ACROSS CENTRAL ARKANSAS INTO NORTH CENTRAL MISSISSIPPI THIS MORNING WILL LIFT NORTHEAST TODAY. THE AIRMASS TO THE SOUTH OF THIS FRONT HAS BECOME WARM... HUMID... AND UNSTABLE. THIS UNSTABLE AIRMASS IS EXPECTED TO OVERSPREAD THE WESTERN HALF OF THE MID-SOUTH BY EARLY AFTERNOON PRIOR TO THE PASSAGE OF A STRONG COLD FRONT. THE INCREASED INSTABILITY COMBINED WITH STRONG ATMOSPHERIC WINDS WILL SET THE STAGE FOR SEVERE WEATHER ACROSS AREAS ALONG AND SOUTH OF THE WARM FRONT AND AHEAD OF THE COLD FRONT. THE GREATEST SEVERE WEATHER RISK WILL EXIST ALONG AND WEST OF INTERSTATE 55 THIS AFTERNOON INTO EARLY EVENING... INCLUDING NORTHEAST AND EAST ARKANSAS... THE MISSOURI BOOTHEEL... SOUTHWEST TENNESSEE... AND NORTHWEST MISSISSIPPI. IN THESE LOCATIONS... SEVERE THUNDERSTORMS ARE EXPECTED TO DEVELOP BY EARLY THIS AFTERNOON AND MOVE QUICKLY EAST THROUGH THE EARLY EVENING HOURS. ANY SEVERE STORMS THAT DEVELOP WILL BE CAPABLE OF PRODUCING DAMAGING WINDS AND A FEW TORNADOES. THERE WILL BE A SECONDARY THREAT FOR LARGE HAIL. THE BEST TIMING FOR SEVERE WEATHER ACROSS THESE LOCATIONS WILL BE BETWEEN 2 PM CST AND 8 PM CST. RESIDENTS ACROSS THE MID-SOUTH ARE URGED TO REMAIN UPDATED WITH THE LATEST FORECAST INFORMATION AND PLAN NOW FOR THE POTENTIAL OF SEVERE WEATHER THIS AFTERNOON AND EVENING. BE PREPARED TO SEEK SAFE SHELTER IN THE EVENT SEVERE WEATHER WARNINGS ARE ISSUED AND SEVERE WEATHER BECOMES IMMINENT. MWN is continuing to closely monitor the possibility of strong to severe thunderstorms in the Mid-South for New Year's Eve, especially with the large crowds of people expected outdoors for the Liberty Bowl game and Beale Street and other New Year's festivities. We have just gotten off a conference call with the National Weather Service office in Memphis discussing the threats, timing, and probabilities of the event. The graphic above contains information relayed by the NWS. The greatest concern is for locations from Shelby County to the west and south, including most of eastern AR and northwest MS. These areas in purple are under a slight risk of severe weather as defined by the Storm Prediction Center. A slightly reduced threat encompasses much of the rest of west TN, including the rest of the metro and Jackson, as well as northeast MS. The primary threats with this system will be damaging straight-line winds and isolated, but possibly strong, tornadoes, especially west and south of Memphis. For the metro area, storms could begin moving in anytime during the afternoon, but particularly late afternoon (after 4pm), with a line of storms expected along the cold front during the evening hours (sometime within an hour or two of 8pm). See below for another graphic showing the meteorological setup, courtesy of the NWS. Following the cold front, rain will be likely for several hours before ending after midnight. MemphisWeather.net will have complete coverage of this weather event. The MWN Storm Center will show the latest watches/warnings if any are issued, as well as radar imagery. Follow us on Facebook and/or Twitter (@memphisweather1) for up-to-the-minute information. Also, be sure to sign up for FREE severe weather alerts by e-mail for any metro county, or on Twitter follow @shelbyalerts for Shelby Co. alerts. Chance for severe weather to ring out the old year? After a pretty (cold) Christmas weekend with snow flurries and/or snow showers depending on where you were, the weather has taken a turn and southerly wind is starting to bring in warm air and Gulf moisture by the truckload. In fact, temperatures are somewhat difficult to forecast (especially overnight lows) this week as the lows are occurring in the evening hours with steady or rising temp overnight for 3 straight nights! In the end, we'll be near 70 Friday afternoon for the kickoff of the Autozone Liberty Bowl featuring the Georgia Bulldogs and Central Florida Knights. Intermittent rain showers will also be possible through Friday. Most of my readers who have been here for a winter or two know that when we hit the 60s at this time of year, it likely ends with a crash - typically a crash of thunder! By Friday, a potent weather system will collide with the moisture-laden Gulf air over the lower and mid-Mississippi River Valley. Wind at all levels of the atmosphere will be strong with this system (and out ahead of it) as well. The stage will be set for thunderstorms, possibly some strong ones, Friday afternoon and evening. The Storm Prediction Center has placed the area under a SLIGHT RISK of severe weather (see graphic) with the impending cold front as ingredients could phase enough to produce damaging wind, large hail, and possibly isolated tornadoes due to strong low level wind shear. We'll keep a close eye on this situation, but at this time I would encourage those attending the Liberty Bowl game to be prepared for rain and thunderstorms and keep a close weather eye to the sky in case severe weather approaches. The time frame most conducive for any severe weather appears to be between 3-9pm. I expect that after 9pm (or about when the cold front passes through), rain will stick around for New Year's Eve festivities downtown (and elsewhere) but the storm threat will be over. Temperatures will fall quickly from the 60s to the 40s behind the front and wind will remain gusty, but from the northwest rather than the south. MemphisWeather.net will have complete coverage of the weather event on Friday. Follow us on Facebook and/or Twitter (@memphisweather1) for up-to-the-minute information. Also, be sure to sign up for FREE severe weather alerts by e-mail for any metro county, or on Twitter follow @shelbyalerts for Shelby Co. alerts. As the trough currently over the eastern U.S. moves over the Atlantic, a new trough will form over the west and begin moving towards the area. Ahead of the trough, surface high pressure will move to our east, bringing wind around to the south by tomorrow and starting a fairly significant warm-up. One piece of energy will move through on Wednesday as a warm front lifts north, bringing high chances of rain during the day. Moist southerly flow will continue Thursday as a couple of low pressure systems begin moving north-northeast through the Plains. A chance of showers will exist in the Mid-South, but mainly it will be much warmer (highs of 60+) and breezes will pick up. For New Year's Eve, a frontal system will move across the region, bringing another round of rain. With the right dynamics in place, thunderstorms could also be likely with a few possibly strong to severe. The map below shows the current probability of precipitation for Friday night (6pm Fri until 6am Sat). There are many parameters that are still unknown at this point, but those with plans, particularly outdoors, on New Year's Eve (day or evening) should monitor this system carefully and watch for later statements or advisories. That would include those attending the Liberty Bowl game featuring SEC powerhouse Georgia and Conference USA champ Central Florida and also those heading downtown to Beale Street for New Year's Eve celebrations. At the very least, plan to have umbrellas or ponchos handy (not sure if umbrellas are allowed in the stadium or not). Heavy rain is definitely a strong possibility, even if severe weather is not. MemphisWeather.net will keep you abreast of the latest forecasts and conditions, as will this blog, and MWN on Facebook and Twitter. Now would be a good time to sign up for severe weather alerts by e-mail for any of the metro counties or follow @shelbyalerts on Twitter for weather alerts for Shelby County. These services pass the info directly on to you as soon as they are received from the National Weather Service. Finally, I'll also direct you to one last article that you should check out. Friend and blogger Paul Yeager of CloudyandCool.com and AOLNews contributor recaps the Top 10 (U.S.) Weather Events of 2010. I strongly agree with #1, which happened to directly impact the Memphis metro area... can you guess? SCATTERED TO NUMEROUS SNOW SHOWERS SHOULD DEVELOP ACROSS THE NORTHERN TWO-THIRDS OF THE MID-SOUTH TODAY AS AN UPPER LEVEL DISTURBANCE MOVES ACROSS THE AREA. AT THIS TIME IT APPEARS THAT SOME LIGHT SNOW ACCUMULATIONS WILL BE POSSIBLE ACROSS NORTHEAST ARKANSAS... 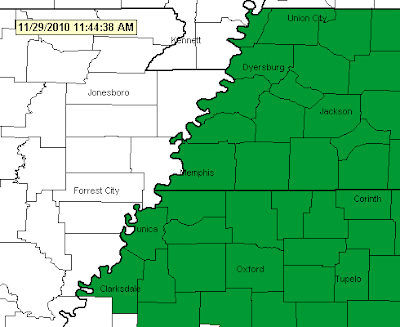 THE MISSOURI BOOTHEEL... WEST TENNESSEE... AND EXTREME NORTHERN MISSISSIPPI. A DUSTING UP TO ONE INCH MAY ACCUMULATE IN SOME LOCATIONS ACROSS THIS BROAD AREA THROUGH THIS EVENING. PLEASE STAY TUNED TO THE LATEST FORECASTS THROUGH THE DAY AS WINTER WEATHER ADVISORIES MAY BECOME NECESSARY ACROSS PORTIONS OF THIS AREA. IF YOU ARE PLANNING TRAVEL TODAY... PLEASE BE AWARE THAT MORE SIGNIFICANT SNOW ACCUMULATIONS ARE EXPECTED FURTHER SOUTH ACROSS NORTHEAST MISSISSIPPI INTO NORTHERN ALABAMA. ELSEWHERE... EXERCISE CAUTION DRIVING IN AREAS WHERE SNOW SHOWERS RESULT IN ACCUMULATIONS. ----Get the latest weather conditions and much more by checking out MemphisWeather.net on Facebook and Twitter! A WHITE CHRISTMAS MAY BE IN STORE FOR NORTHERN AND EASTERN SECTIONS OF THE MID-SOUTH. A STORM SYSTEM WILL SPREAD LIGHT PRECIPITATION ACROSS THE REGION LATER TODAY THROUGH TONIGHT. IN THE METROPOLITAN MEMPHIS AREA... PRECIPITATION WILL BEGIN AS LIGHT RAIN LATE THIS AFTERNOON CONTINUING INTO THIS EVENING. A CHANGEOVER TO LIGHT SNOW IS EXPECTED LATER TONIGHT WITH SNOW ACCUMULATIONS BETWEEN A DUSTING AND ONE HALF INCH EXPECTED BEFORE PRECIPITATION TAPERS OFF DURING THE PREDAWN HOURS. SNOW SHOWERS SHOULD REDEVELOP AREAWIDE ON CHRISTMAS DAY AND PERSIST INTO SUNDAY ACROSS PORTIONS OF THE REGION. ADDITIONAL SNOW ACCUMULATIONS WILL BE POSSIBLE THROUGH SATURDAY WITH STORM TOTALS OF UP TO ONE-HALF TO ONE INCH POSSIBLE BY CHRISTMAS NIGHT. THE LAST OCCURRENCE OF MEASURABLE SNOW ON THE GROUND ON CHRISTMAS MORNING WAS 2004... HOWEVER THE ONLY MEASURABLE SNOWFALL RECORDED IN MEMPHIS / SINCE THE LATE 1800S / ON CHRISTMAS DAY OCCURRED IN 1913. THERE STILL REMAINS SOME UNCERTAINTY WITH RESPECT TO THE OVERALL PRECIPITATION AMOUNTS AND TYPES. WINTER WEATHER ADVISORIES MAY BE POSSIBLE LATER TODAY THROUGH MUCH OF THE CHRISTMAS HOLIDAY WEEKEND ACROSS PORTIONS OF THE MID-SOUTH. STAY TUNED TO THE LATEST FORECASTS FROM THE NATIONAL WEATHER SERVICE AND MEMPHISWEATHER.NET FOR UPDATES OR POSSIBLE ADVISORIES. Get the latest on potential winter weather and much more by liking MemphisWeather.net on Facebook and following on Twitter! A LOW PRESSURE SYSTEM WILL TRAVERSE THE SOUTHERN UNITED STATES TODAY THROUGH FRIDAY... AND EMERGE OVER THE NORTHERN GULF OF MEXICO FRIDAY NIGHT. A WINTRY MIX IS EXPECTED TO DEVELOP BEGINNING LATE FRIDAY AFTERNOON WELL NORTH OF THE MEMPHIS METROPOLITAN AREA. MAINLY RAIN IS EXPECTED ALONG AND SOUTH OF I-40 IN EASTERN ARKANSAS WITH VERY LITTLE FALLING EAST OF THE MISSISSIPPI RIVER THROUGH FRIDAY AFTERNOON. AS THE SYSTEM APPROACHES AND BEGINS TO INTERACT WITH AN UPPER LEVEL DISTURBANCE TO THE NORTH... PRECIPITATION WILL BECOME MORE WIDESPREAD FRIDAY EVENING. AT THIS POINT... IT APPEARS RAIN WILL FALL IN THE METRO AREA WITH A MIX OF PRECIPITATION /RAIN-SNOW-SLEET/ FARTHER NORTH. COLDER AIR WILL BEGIN PUSHING SOUTH LATER FRIDAY EVENING AND ESPECIALLY OVERNIGHT ALLOWING PRECIPITATION TO CHANGE TO SNOW FROM NORTH TO SOUTH. THE RAIN/SNOW LINE SHOULD BE LOCATED NEAR THE TENNESSEE/MISSISSIPPI STATE LINE AROUND MIDNIGHT. THE SYSTEM WILL PUSH EAST AND LEAVE A FEW LIGHT SNOW SHOWERS OR FLURRIES... POSSIBLY MIXED WITH DRIZZLE... IN ITS WAKE FOR CHRISTMAS DAY. LATEST SNOWFALL PROJECTIONS INDICATE AROUND AN INCH WILL BE POSSIBLE IN NORTHERN PORTIONS OF THE METRO AREA BY SATURDAY. SLIGHTLY LOWER ACCUMULATIONS AROUND ONE HALF INCH ARE EXPECTED NEAR THE MISSISSIPPI/TENNESSEE STATE LINE DUE TO A LATER CHANGE OVER TO SNOW. WHILE THERE ARE STILL UNCERTAINTIES WITH THIS FORECAST... IT APPEARS PORTIONS OF THE MID-SOUTH MAY BE PLACED UNDER A WINTER WEATHER ADVISORY IN LATER FORECASTS. THIS IS A LARGE SYSTEM AFFECTING MUCH OF THE CENTRAL AND EASTERN PARTS OF THE COUNTRY SO IF YOU PLAN TO TRAVEL... STAY TUNED TO LATER FORECASTS. Get the latest on expected winter weather conditions by checking out MemphisWeather.net on Facebook and Twitter! A couple of days ago, I poo-poo'd the idea of a White Christmas, mainly because I'm a grinch. OK, I'm kidding. Actually, because at 5 days out, and given our history (no measurable snowfall on Christmas Day in nearly a century), I didn't want to wish-cast in some snow and then have to disappoint everyone by taking it out. It's now 48 hours closer to Christmas and the National Weather Service is jumping on board, as are local media outlets. This morning I had seen enough (from the computer models, not from every other media outlet) to persuade me to put snow chances back in the MWN forecast for Christmas. Here's MWN's official stance as of this minute... subject to change on a whim. Two pieces of atmospheric energy will split the area Friday night and Saturday - one to the north and one to the south. Their proximity to the metro area (and relative strength) determines our precipitation chances. I now am fairly convinced that most of the daytime hours Friday will be dry. I'm sticking with a 20% chance of rain in the afternoon. By evening, as colder air moves in, some of the rain could mix with light sleet. Again, minimal amounts are expected, if any. After midnight, the atmosphere moistens up enough to start discussing some accumulation and cold air deepens over the region. I believe we could see a round of light snow between midnight and 9am Christmas Day (Saturday). Depending on the scenario that plays out, it could be a dusting to possibly an inch in the northern areas (say Tipton Co. and north). The image below is a Memphis sounding from this morning's GFS computer model valid Christmas morning at 6:00am. It shows moisture in the lowest ~6,000 feet of the atmosphere (red and green lines nearly touching) and temperatures below freezing in the entire column (red line less than 0 Celsius). During the day on Christmas, temperatures will remain near freezing and scattered light snow showers will be possible throughout the day. Very little if any accumulation is expected from these snow showers, maybe as much as a quarter to half inch. In all, I'd be surprised to see anyone in the metro area with more than an inch and I believe a quarter to half inch total is much more likely. I am not guaranteeing snow, but I am saying that it looks more likely than it did yesterday. The last "White Christmas" (snow on the ground Christmas morning) in Memphis was 2004 (2" from a previous day storm). The last time measurable snow fell ON Christmas Day was 1913! Here's to opening presents with flakes falling outside! Get the latest on the expected winter weather and much more by checking out MemphisWeather.net on Facebook and Twitter! LOW PRESSURE CURRENTLY OVER THE SOUTHWESTERN UNITED STATES WILL TRACK EASTWARD ALONG THE GULF COAST SATURDAY AND SATURDAY NIGHT. MEANWHILE... AN UPPER LEVEL PIECE OF ENERGY WILL DIVE ACROSS THE MIDSOUTH LATE FRIDAY NIGHT AND SATURDAY MORNING. IT APPEARS THESE TWO FEATURES WILL SPREAD A MIXTURE OF RAIN AND SOME SLEET ACROSS NORTHEAST ARKANSAS... THE MISSOURI BOOTHEEL.. AND WESTERN TENNESSEE LATE FRIDAY AFTERNOON. THE PRECIPITATION WILL BECOME MORE WIDESPREAD FRIDAY NIGHT AND TURN TO ALL SNOW FROM NORTH TO SOUTH AS COLDER AIR ADVANCES ON THE MIDSOUTH. THE SNOW COULD PERSIST INTO CHRISTMAS MORNING MAINLY EAST OF THE MISSISSIPPI RIVER WITH FLURRIES OR LIGHT SNOW SHOWERS POSSIBLE DURING THE AFTERNOON. FORECAST MODELS ARE NOW BEGINNING TO CONVERGE ON A GENERAL SOLUTION... BUT EXACT DETAILS ARE STILL UNCERTAIN. AT THIS POINT... 1 TO 2 INCHES OF SNOW COULD FALL ON MUCH OF THE MIDSOUTH FRIDAY NIGHT AND SATURDAY MORNING LEADING TO A WHITE CHRISTMAS IN MANY AREAS AND PRODUCING SOME TRAVEL PROBLEMS. A WHITE CHRISTMAS IS VERY RARE FOR THIS PART OF THE COUNTRY. THE LAST TIME MEMPHIS HAD AT LEAST A HALF INCH OF SNOW ON THE GROUND MAKING FOR A WHITE CHRISTMAS WAS IN 2004. EVEN MORE RARE IS MEASURABLE SNOWFALL ON CHRISTMAS DAY. THE LAST TIME THAT HAPPENED WAS IN 1913. THOSE WITH TRAVEL PLANS SHOULD STAY ABREAST TO THE LATEST FORECASTS. THIS IS A COMPLICATED SYSTEM AND THE FORECAST IS SUBJECT TO CHANGE. I have bad news... and bad news. Which do you want first? I've been hemming and hawing (is that how you write that, I don't think I have ever actually typed those words...) on the threat of wintry precipitation for Christmas Eve / Christmas Day. As of this afternoon, the MWN Forecast this afternoon will only reflect rain with the late-week cold front, due to arrive on Friday. For now, I'm more certain that the cold air will arrive after the precipitation departs than not, thus the decision to remove snow flurries from the forecast. Second, while the vast majority of us (except perhaps my avid Kindergarten following) will not be around in 84 years (the next time this happens), we're going to miss a chance to see the coincidence of a total lunar eclipse on the winter solstice. That same forecast mentioned above indicates cloudy skies for tonight with light rain or drizzle moving in. Sorry about that. I know, two disappoints in one post is likely more than you can handle. I'll try and make the next one more upbeat. The next total lunar eclipse will be in just over 3 years - hopefully you'll be around to enjoy it with me! A couple of events in the world of astronomy will line up on Tuesday for the first time in 372 years and won't happen again for another 84 years. Most people probably know of both, but may not have put two and two together yet to realize they happen on the same day. The most obvious is the occurrence of the winter solstice, or what we commonly call the first day of winter. 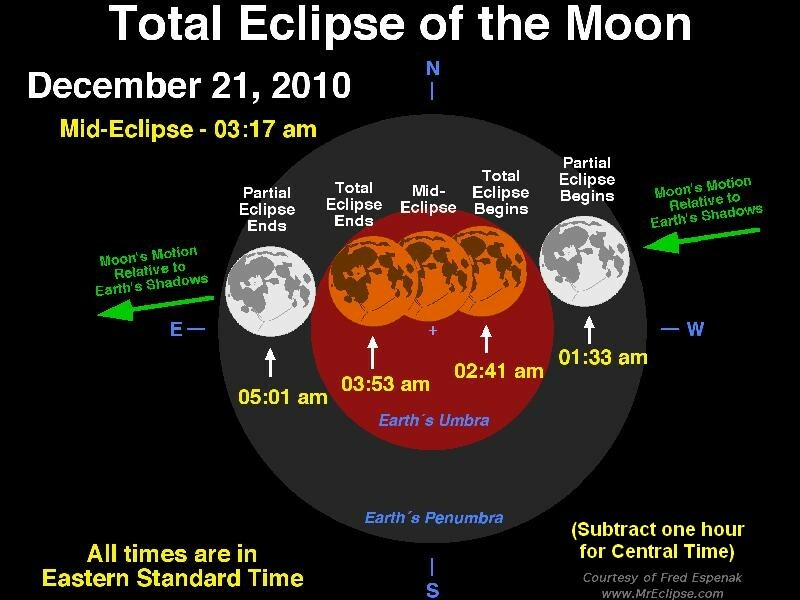 The other is a total lunar eclipse, which will be visible to all North Americans given the right weather conditions. Starting with the eclipse... a lunar eclipse occurs when the Earth lines up directly between the sun and the moon, causing the Earth's shadow to be thrown over the moon. A total lunar eclipse is when the entirety of the moon is within the Earth's shadow and is less common than a partial eclipse. The next total lunar eclipse visible in the United States is not for another 3+ year - April 15, 2014. When the eclipse occurs, the moon will turn grey, then an orangish-red color as the eclipse becomes total, before returning to it's normal state. Graphic courtesy Mr. Eclipse. Click for larger image. In order to view the eclipse, you'd have to get up in the middle of the night (early Tuesday morning). The partial phase begins at 12:33 am CST. 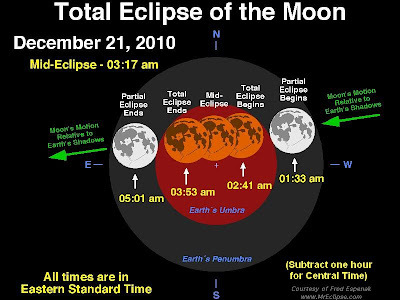 The total eclipse lasts from 1:41 am-2:53 am, or a lengthy 72 minutes, with "mid-eclipse" occurring at 2:17 am. The eclipse will be complete by 4:01 am. The graphic above shows these times as well (subtract one hour to convert from Eastern Standard Time). The only problem with Memphis viewing conditions will be the weather. Unfortunately, as of this writing (Sunday afternoon), MemphisWeather.net is forecasting overcast conditions with a chance of light rain during that time frame so we may have to settle for pictures or video from other parts of the country, or you can check out a cool animation and see what you might miss at ShadowandSubstance.com. You can also see a series of photos taken of a lunar eclipse several years ago by MemphisWeather.net here. If weather conditions improve, we'll be sure to let you know! The other event, the winter solstice (Wikipedia), is the point in time when the Earth's axis is most inclined away the sun, yielding the shortest day of the year for the Northern Hemisphere and the beginning of our winter. It is also the day when the apparent position of the sun is the lowest in the sky for those in the Northern Hemisphere. Areas around the south pole get light all day as the Earth rotates, while those areas at the north pole are in darkness all day. (So I guess Santa Claus will be finishing up his list with the assistance of gas lanterns or a cozy fireplace). The exact timing of the solstice this year is 5:38 pm CST. A Winter Weather Advisory is now in effect until noon for the metro counties (3pm for Tipton Co. and points north) as light precipitation has developed and is moving east through the area. I expect light precip to continue to develop through the morning hours and affect the region as a warm front to our south starts moving in our direction. Temperatures and dewpoints are crucial at this time, with the majority of the suburban area remaining just above freezing (35 at Memphis Int'l seems to be the warmest spot) and dewpoints still in the teens. I believe that as precipitation continues, temperatures will drop slightly and dewpoints will rise - caused by a process called evaporative cooling, in which moisture falling through a column of dry air moistens that column and cools the surrounding air. A small amount of evaporative cooling will bring temps to near or just below freezing for a few hours this morning before rising again (back above freezing) by mid-morning. The biggest question is whether enough precipitation will affect the region to cause those temps to fall to freezing. For now, I believe that we will continue to see additional precipitation forming and, assuming this occurs, expect temps to dip slightly before rebounding later in the morning. Thus, a chance of freezing rain and/or sleet through mid-morning throughout the metro. With temperatures already so close to freezing, please be extremely cautious on your commute into work or school this morning. A degree here or there could mean the difference between a glaze of ice (which is hard to see on roadways) and just wet streets. Memphis metropolitan area school closings for Wednesday, December 15, 2010 will be posted on the MWN Blog as they are received. Click the "Metro School Closings" link in the blog menu at the top of the page or click here. Feel free to submit your information to us by e-mail at closings@memphisweather.net or via Facebook or Twitter (@memphisweather1). A Winter Weather Advisory is now in effect for Shelby County and points south and west (Crittenden Co. and northeast MS) from 6am until noon on Wednesday. Light freezing rain and/or sleet will move into the Memphis metro area around or shortly after daybreak and could affect rush hour travel. Areas north and east of Shelby County, including Fayette and Tipton Counties, will be under the Advisory until 3pm as precipitation lingers in a frozen state a little longer. Any freezing rain and/or sleet will change over to light rain by noon in the suburban area. Minor accumulations are possible during the morning, but rising temperatures will contribute to melting of any ice by early afternoon in the city and immediate suburbs, as well as over north MS. Locations north and east of a line from Jonesboro to Jackson to Corinth should be prepared for the possibility of more significant icing that could hamper travel, particularly on secondary roadways, by late morning to afternoon. Temperatures may not rise above freezing until late in the afternoon in those areas. Temperatures will remain well above freezing Wednesday night, thus there is no threat of winter weather Wednesday night or Thursday. The next chance for wintry precipitation arrives Friday night. Check the MWN Forecast for details. MWN on the web, Facebook, and Twitter (@memphisweather1) will have all of the information you need to stay on top of this winter weather scenario. .A DEVELOPING AREA OF LOW PRESSURE IN THE SOUTHERN PLAINS WILL TRACK ACROSS THE AREA AND GRADUALLY PUSH A WARM FRONT INTO THE MID-SOUTH BY LATE WEDNESDAY. MOISTURE AHEAD OF THE FRONT WILL PRODUCE LIGHT AMOUNTS OF PRECIPITATION THAT WILL FALL THROUGH THE CURRENT SHALLOW ARCTIC AIRMASS OVER THE REGION. TEMPERATURES ON WEDNESDAY WILL REMAIN NEAR OR BELOW FREEZING THROUGH THE MORNING HOURS. THE LIFT FROM THE WARM FRONT AND THE SUB-FREEZING TEMPERATURES WITH PRODUCE A MIXTURE OF SLEET AND FREEZING RAIN. THE NATIONAL WEATHER SERVICE IN MEMPHIS HAS ISSUED A WINTER WEATHER ADVISORY... WHICH IS IN EFFECT FROM 6 AM TO 3 PM CST WEDNESDAY. * SLEET/ICE ACCUMULATIONS: LESS THAN A QUARTER OF AN INCH. * TIMING: WINTRY PRECIPITATION WILL MOVE INTO THE AREA BY 6AM. IT IS EXPECTED THAT TEMPERATURES WILL RISE ABOVE FREEZING BY LATE MORNING IN THE METRO AREA AND EARLY AFTERNOON IN AREAS NORTH OF THE SUBURBS... ENDING THE THREAT OF WINTRY PRECIPITATION. ANY LIGHT ACCUMULATIONS OF ICE THAT ACCUMULATE SHOULD MELT BY EARLY AFTERNOON AS TEMPERATURES WARM. * IMPACTS: ROADS WILL BECOME SLICK QUICKLY WITH SECONDARY ROADS AND BRIDGES POSSIBLY BECOMING ICE-COVERED. A WINTER WEATHER ADVISORY MEANS THAT PERIODS OF SNOW... SLEET... OR FREEZING RAIN WILL CAUSE TRAVEL DIFFICULTIES. BE PREPARED FOR SLIPPERY ROADS AND LIMITED VISIBILITIES...AND USE CAUTION WHILE DRIVING. I was going to blog on the possibility of freezing rain Wednesday morning and then read Ryan Vaughan's blog post on the same topic. Ryan (@ryanvaughan on Twitter) is the Chief Meteorologist at KAIT-TV 8 in Jonesboro, a great guy, and very knowledgable about all things weather. He explains complicated weather phenomena in an easy-to-understand manner, as any TV weatherman worth his salt should be able to do. I decided after reading his post that I couldn't do any better, particularly explaining the weather setup, so I decided to just share it! A very similar scenario is expected in Memphis early Wednesday with the timing of any potential winter precipitation being roughly between 4-10am. As in Jonesboro, any freezing precipitation should be very light with little accumulation. But of course it doesn't take much when it is glaze! Remember we're talking about Memphis drivers (yes, I mean you)! So here it is: Ryan's Blog: Ice This Week? Check back with MemphisWeather.net for the latest on the possibility of winter weather in the Mid-South. A STRONG ARCTIC COLD FRONT WILL MOVE THROUGH THE MID-SOUTH TONIGHT... BRINGING VERY COLD ARCTIC AIR INTO THE REGION. A TIGHTENING PRESSURE GRADIENT WILL CAUSE WINDS TO STRENGTHEN LATE TONIGHT AND PERSIST UNTIL SUNDAY NIGHT. SUSTAINED WINDS AROUND 25 MPH AND WIND GUSTS OF 40 MPH ARE POSSIBLE DURING THIS TIME FRAME. HIGHS SUNDAY ARE LIKELY TO ONLY REACH THE MID 30S. COLDER AIR WILL CONTINUE SPILLING SOUTHEAST INTO THE MID-SOUTH SUNDAY NIGHT WITH TEMPERATURES DROPPING INTO THE MID TEENS. THESE TEMPERATURES IN COMBINATION WITH THE GUSTY WINDS SHOULD SEND WIND CHILL READINGS NEAR ZERO BY EARLY MONDAY MORNING. WIND CHILL ADVISORIES WILL LIKELY BE NEEDED FOR PARTS OF THE AREA SUNDAY NIGHT. THE COLD TEMPERATURES WILL PERSIST MONDAY WITH HIGHS SLIGHTLY BELOW FREEZING AND LOWS AGAIN IN THE TEENS TUESDAY MORNING. IN ADDITION TO THE COLD... MOISTURE WRAPPING AROUND THE LOW MAY PRODUCE SOME SNOW SHOWERS ACROSS THE AREA LATE TONIGHT AND SUNDAY. LITTLE...IF ANY SNOW ACCUMULATIONS ARE EXPECTED AT THIS TIME. RESIDENTS OF THE MID-SOUTH SHOULD PREPARE FOR A BIG SHIFT TO VERY COLD WEATHER FOR THE REMAINDER OF THE WEEKEND INTO EARLY NEXT WEEK. CONSIDER WINTERIZING YOUR VEHICLE... LETTING FAUCETS DRIP SLIGHTLY TO AVOID BURSTING PIPES...AND BRINGING OUTDOOR PETS INSIDE FROM THE COLD. A LOW PRESSURE SYSTEM WILL TRACK ACROSS THE LOWER GREAT LAKES SATURDAY AND SATURDAY NIGHT. THIS SYSTEM WILL SEND AN ARCTIC COLD FRONT THROUGH THE MIDSOUTH SATURDAY EVENING. RAIN WILL DEVELOP ALONG AND AHEAD OF THE FRONT BEGINNING LATE TONIGHT ACROSS EASTERN ARKANSAS AND THEN SPREAD ACROSS THE ENTIRE MIDSOUTH FOR SATURDAY. A FEW THUNDERSTORMS WILL LIKELY ACCOMPANY THE RAIN... BUT DUE TO LIMITED INSTABILITY NO SEVERE WEATHER IS IN THE FORECAST. 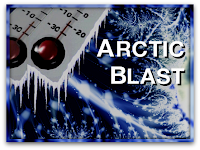 STRONG ARCTIC HIGH PRESSURE IS EXPECTED TO BUILD INTO THE PLAINS BEHIND THE SYSTEM... WHICH WILL AID IN SENDING VERY COLD AIR SOUTH. A TIGHTENING PRESSURE GRADIENT WILL CAUSE WINDS TO STRENGTHEN SATURDAY NIGHT AND PERSIST THROUGH SUNDAY NIGHT. SUSTAINED WINDS AROUND 25 MPH AND WIND GUSTS APPROACHING 40 MPH ARE POSSIBLE DURING THIS TIME FRAME. WIND ADVISORIES MAY BE NEEDED. HIGHS SUNDAY ARE LIKELY TO ONLY TOP OFF AROUND FREEZING ALONG AND NORTH OF I-40 WITH MID OR UPPER 30S ACROSS NORTHERN MISSISSIPPI. COLDER AIR WILL CONTINUE SPILLING SOUTHEAST INTO THE MIDSOUTH SUNDAY NIGHT WITH TEMPERATURES DROPPING INTO THE LOW TEENS NORTH OF I-40 AND MID TEENS ELSEWHERE. THESE TEMPERATURES IN COMBINATION WITH THE GUSTY WINDS SHOULD SEND WIND CHILL READINGS BETWEEN 5 ABOVE ZERO AND 7 BELOW ZERO BY EARLY MONDAY MORNING. WIND CHILL ADVISORIES WILL LIKELY BE NEEDED FOR PARTS OF THE AREA SUNDAY NIGHT. THE COLD TEMPERATURES WILL PERSIST MONDAY WITH HIGHS IN THE MID 20S TO MID 30S. IN ADDITION TO THE COLD... MOISTURE WRAPPING AROUND THE LOW COULD ALLOW FOR SOME SNOW SHOWERS ACROSS WEST TENNESSEE... NORTHEAST ARKANSAS AND THE MISSOURI BOOTHEEL LATE SATURDAY NIGHT AND SUNDAY. LITTLE... IF ANY SNOW ACCUMULATIONS ARE EXPECTED AT THIS TIME. RESIDENTS OF THE MIDSOUTH SHOULD PREPARE FOR A BIG SHIFT TOWARD VERY COLD WEATHER LATER THIS WEEKEND. CONSIDER WINTERIZING YOUR VEHICLE... LETTING FAUCETS DRIP SLIGHTLY TO AVOID BURSTING PIPES... AND BRINGING OUTDOOR PETS INSIDE FROM THE COLD. Get the latest weather conditions, forecasts, and much more by following MemphisWeather.net on Facebook and Twitter! The Mid-South is on the backside of the first major blast of Arctic winter air, having been through 4 days of well below normal temperatures, with highs near 40 and lows well into the 20s (teens in some areas away from the concrete of the city). The weather will continue it's roller coaster pattern for the next 7 days, with two "peaks" and one more deep valley in the next week. High pressure will move overhead tonight, bringing perhaps one of the coldest nights of the season to date, as wind dies down and skies will be clear. Look for temperatures in the teens in outlying areas tonight and lower 20s in the big city. Southerly wind picks up tomorrow, as opposed to the north wind of the past several days, as high pressure moves east and the area sets up for the next weather-maker. The mercury will rise quickly tomorrow morning, landing us near 50 tomorrow afternoon as high clouds increase. Southerly wind continues into Friday, keeping low temps Friday morning "up" near freezing with highs Friday a downright balmy 54 degrees! We'll see showers (of rain) develop Friday night as low pressure moves towards the area. Clouds and wind will keep temperatures in the 40s. As the low tracks through the Mid-South Saturday, there will be very high rain chances, some thunder possible, and rain amounts could reach an inch or more (see expected precipitation totals on the graphic above). The heaviest precip is expected Saturday afternoon. The low will be followed by another blast of very cold air. Wind shifts to the north and temps drop quickly Saturday evening with a low near 30 Sunday morning. Lingering precipitation could change over to light snow, with little accumulation expected, late Saturday evening. Sunday will likely be unpleasantly cold as clouds hang on at least early in the day, with flurries still possible, wind blowing at 20-25 mph, and temperatures staying in the 30s throughout the day. 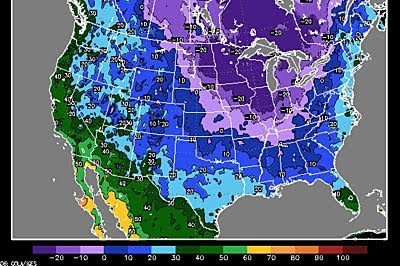 This Arctic blast will be part of an outbreak of very cold air that will invade the midwestern U.S. for the start of next week (see Accuweather's wind chill forecast for 7am Monday above, showing single digit "feels like" temps for the Mid-South and -20s over much of the nation's heartland). Monday will be sunny but continued very cold, though this bout of cold air will not hang around as long as the latest one and we'll be back on the upswing by mid-week. Another system could bring rain by that time, but for now the forecast remains dry until computer models get a better handle on the situation. 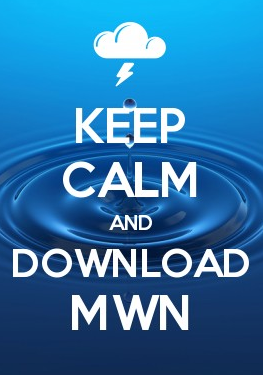 The MWN Forecast for the metro area can be found here. Stay on top of the latest weather conditions and forecasts by following MemphisWeather.net on Facebook and Twitter! November is generally a transition month in the Mid-South as winter draws closer, the growing season ends, and there are typically some very pleasant days. While the drought of previous months abated, temperatures averaged a little above normal as well. Even with the rain, the area was still classified as being in a moderate to severe drought as the month closed. For November, the average temperature was 53.9 degrees, which was 1.6 degrees above normal. The average high temperature was a pleasant 64.7 degrees and the average low was 43.0. The freezing mark was reached four times during the month, with the 2010 growing season ending on the 6th as the mercury dropped to 32. The lowest temperature for the month was 31 degrees and the highest temperature was 79. Precipitation for the month of November totaled 6.57", or 0.81" above the normal of 5.76". It was the first month since July 2010 in which monthly precipitation was above normal. There were 12 days with measurable rainfall and the maximum 24-hour total was 2.04" on the 25th-26th. A trace of sleet/ice pellets was recorded on the 26th as Arctic air arrived just as rainfall was ending very early on Black Friday morning. The peak wind gust was 38 mph on the 24th, while the average wind speed for the month was 7.1 mph. Click here for a daily statistical recap for Memphis International for November. The average temperature for November at the WXLIVE! station in north Bartlett was 51.4 degrees with a maximum of 79.6 on the 1st and a minimum of 25.0 degrees on the 6th. November precipitation ended above normal with a rainfall total of 5.98". A co-located manual gauge used for the CoCoRaHS program measured 6.32". A trace of sleet/ice pellets was recorded on the 26th and again on the 30th. The peak wind gust was 29 mph on the 24th. Average relative humidity was 70%. Click here for a daily recap on MemphisWeather.net. For the month of November, the average temperature error in all MWN temperature forecasts was 3.17 degrees, lower than all compared computer models, including the National Weather Service. Nearly 50% of the MWN temperature forecasts for the month were within 2 degrees of the actual temperature. MWN's forecasts extend out five periods (or 2.5 days). For dewpoint accuracy, the MWN forecast was also the best of the data sources at 3.02 degrees average error and was within 2 degrees of the actual dewpoint 50% of the time. Detailed accuracy statistics can be found here. 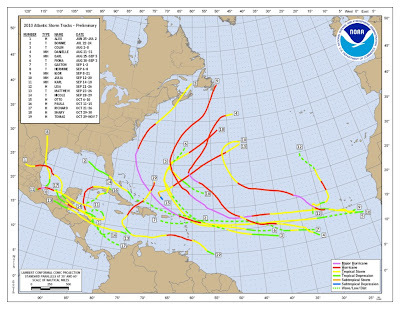 As predicted by all of the major players at the start of this year's Atlantic hurricane season, 2010 proved to be a very active year. The factors which came together to make this year about twice as active as the average year included a moderate La Nina event in the eastern Pacific resulting in lower than normal wind shear over the Atlantic, and very warm sea surface temperatures in the Atlantic and Caribbean. Fortunately, there also was also persistent high pressure along the Gulf Coast, the Bermuda High was displaced eastward from it's normal position, and more strong troughs of low pressure over the U.S. East Coast than usual. These factors combined to produce an "offense that couldn't score from the Red Zone" as Accuweather's Joe Bastardi metaphorically stated -- an abnormally high number of storms with an almost unprecedented lack of U.S. landfalls. The 19 named storms was the 3rd highest total in recorded history (behind 2005 and 1933). The 12 hurricanes tied 2010 with 1969 as the 2nd highest hurricane count (first: 2005 with 15). Despite a season that was roughly twice as active as the average year, only one weak Tropical Storm (Bonnie) made a direct U.S. landfall, hitting south FL in August with 40 mph wind. Hermine narrowly missed direct landfall, striking extreme northeastern Mexico, but brought flooding to the Rio Grande basin of southern TX. Hurricane Earl also grazed the eastern seaboard. Typically, about 1/3 of all named storms reach a U.S. coastline. Until 2010, there have been no seasons with 10+ hurricanes in which none struck the U.S. There have been 18 consecutive hurricanes, dating back to 2008, which have missed the U.S.
No major hurricanes (category 3+) have hit the U.S. since Wilma in 2005 (Katrina was also a 2005 storm). This 5-year drought has not happened since 1915 and there is no precedent for a 6-year period without a U.S. land-falling major hurricane (uh-oh?). 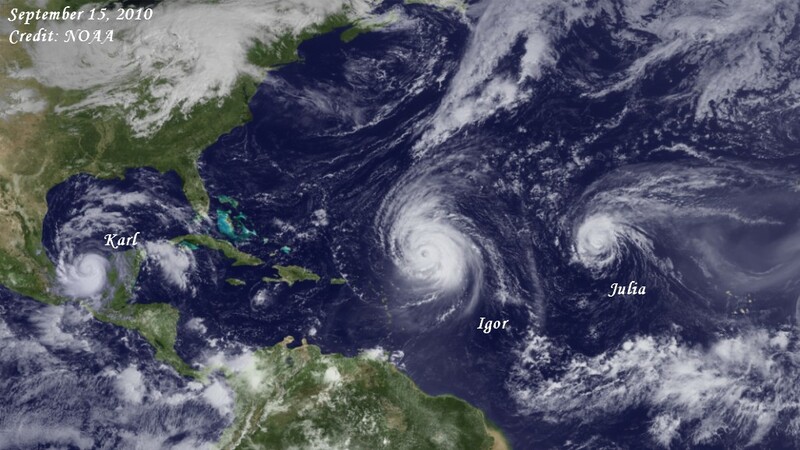 There were 3 hurricanes occurring simultaneously on September 16 (Karl, Igor, Julia), which has occurred only 8 other times in recorded history (see the satellite image of these storms above). 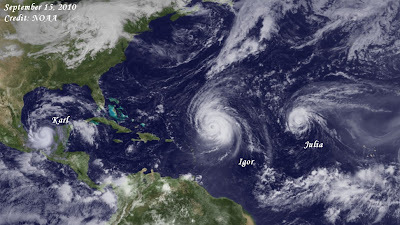 On the previous day (September 15), Igor and Julia were simultaneously at category 4 strength, only the 2nd time this has been known to occur. A total of four category 4+ storms occurred in 2010 (tied for 3rd for most cat 4+ storms in a year) and all four occurred within a 20-day span -- also a record. We extend our thanks to Jeff Masters at Weather Underground and his sources, as well as NOAA, for originally publishing many of these stats. You may also be interested in a NOAA story on the 2010 season, a "gentle giant" as it is referred to. You can find it here. It will be interesting to see what 2011 has in store and whether or not the streak of non-land-falling storms continues! Tornadoes struck portions of Mississippi late Monday evening as a potent weather system moved through the region. Thankfully, the severe weather stayed south of the Memphis metropolitan area, however other folks weren't so lucky. The image above shows the warnings issued as the storm system moved through. Below are storm survey results conducted by the NWS on storms in Monroe County, MS (in the Memphis NWS service area) and Oktibbeha County, home to Starkville and Mississippi State University. * LOCATION OF EVENT: 8 MILES SOUTH SOUTHEAST OF AMORY. * TIME OF EVENT: APPROXIMATELY 1152 PM CST ON NOVEMBER 29 2010. * BEGINNING POINT: LATITUDE: 33 DEG...52 MIN...36.0 SEC. LONGITUDE: 88 DEG...27 MIN...45.9 SEC. * ESTIMATED PEAK WIND: APPROXIMATELY 115 MPH. * PATH LENGTH: 500 YARDS. * MAXIMUM WIDTH: 125 YARDS. * FATALITIES: NONE AT THIS TIME. 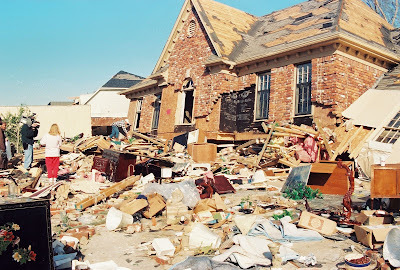 * SUMMARY OF DAMAGES: APPROXIMATELY 20 MANUFACTURED HOMES DAMAGED OR DESTROYED... TREES SNAPPED AND POWER LINES DOWN. SUMMARY OF DAMAGE: INITIAL DAMAGE WAS ROOF AND SIDING DAMAGE TO A CHURCH ALONG LYNN LANE. THE TORNADO MOVED NORTHEAST THROUGH AN AREA OF APARTMENT BUILDINGS, CAUSING MINOR TO MODERATE ROOF DAMAGE TO A NUMBER OF BUILDINGS, AS WELL AS DOWNING SEVERAL TREES. THE TORNADO THEN MOVED INTO THE PINES TRAILER PARK, WHERE IT DESTROYED A NUMBER OF MOBILE HOMES. TWO LARGE MOBILE HOMES WERE ROLLED AND DESTROYED, AND SEVERAL MOBILE HOMES WERE MOVED A SUBSTANTIAL DISTANCE AND DESTROYED. NUMEROUS LARGE PINE TREES WERE SNAPPED NEAR THE BASE, WITH SEVERAL LANDING ON MOBILE HOMES CAUSING MAJOR DAMAGE. NUMEROUS UTILITY LINES WERE SNAPPED AND DOWNED, AND A COUPLE OF POLES WERE DOWNED. THIS WAS THE LOCATION OF MAXIMUM DAMAGE. THE TORNADO THEN MOVED NORTHEAST ACROSS LOUISVILLE ROAD, CAUSING ROOF DAMAGE TO SEVERAL HOMES AND CONTINUING TO SNAP TREES. IT MOVED THROUGH ANOTHER TRAILER PARK, BLOWING OUT THE SKIRTING ON SEVERAL MOBILE HOMES AND CAUSING MINOR ROOF AND STRUCTURAL DAMAGE TO A COUPLE. AS THE TORNADO PASSED THROUGH THE EAST SIDE OF THE STARKVILLE HIGH SCHOOL COMPLEX, IT TWISTED SOME LIGHT STANDARDS ON THE ATHLETIC FIELDS AND CAUSED SOME MINOR FENCE DAMAGE. IT THEN CROSSED YELLOW JACKET DRIVE, BLOWING OUT A PORCH ON A RESTAURANT AND CAUSING SOME MINOR ROOF DAMAGE. AS IT CROSSED HIGHWAY 12, IT BLEW DOWN A COUPLE OF TRAFFIC LIGHTS, BLEW OUT A BUSINESS SIGN, AND DAMAGED ANOTHER PORCH ON A RESTAURANT. THE TORNADO SNAPPED A FEW TREES AND CAUSED SOME SHINGLE DAMAGE TO A COUPLE OF HOMES ON SOUTH MONTGOMERY STREET, AND THEN APPEARS TO HAVE DISSIPATED. THE TORNADO WAS RATED EF2 BASED ON THE SMALL AREA OF THE MOST INTENSE DAMAGE IN THE PINES TRAILER PARK; THE REMAINDER OF THE DAMAGE WAS GENERALLY EF1 IN NATURE. In addition, while the survey results are not available yet as of this writing, Accuweather blogger Jesse Ferrell took a look at the preliminary information on an EF-2 tornado that struck Yazoo City, MS last night, along nearly the same track as the EF-4 Yazoo City tornado in April. Here's the post. A strong frontal system is poised to move through the region this evening. 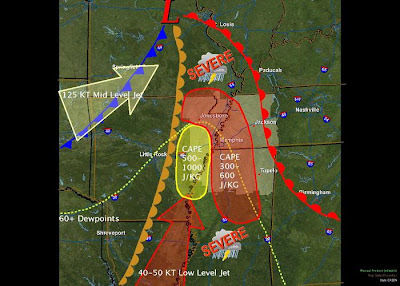 Atmospheric conditions are coming together to create the potential for severe weather over the Lower Mississippi River Valley into parts of the Tennessee Valley, including a portion of the Mid-South. In addition, the risk for flooding in low-lying and urban areas remains as well. The map above shows the SLIGHT RISK area that the Storm Prediction Center will be closely monitoring today. Storms are expected to increase in intensity by mid-afternoon along the western portion of the slight risk area and move slowly east overnight. As you can see, the Memphis area is now encompassed within the slight risk. The most likely time for severe weather in the metro area will be between 4-10 pm with the main risks being damaging thunderstorm wind and isolated tornadoes. The second map (above) highlights the tornado risk area for today and tonight. As low pressure develops and moves northeast through Arkansas, areas ahead of the low (in the "warm sector"), mainly SE AR, NW LA, and MS, will be at the most risk of seeing tornadoes. The risk extends north into the metro area though as well, just not as high of a threat. The areas within the hatched blue circle have the greatest threat of significant tornadoes. Finally, this weather system will be quite the rain-maker as well. The last map above shows the expected 12-hour rainfall totals from noon today until midnight tonight. Most of the area should see anywhere from 1-2" of rain, while isolated areas could see higher amounts. This is the reason for the Flash Flood Watch that is in effect, which could be exacerabted by the heavy rain we received last week. MemphisWeather.net will have full coverage of this developing weather scenario on the web, Twitter (@memphisweather1), and Facebook (MemphisWeather.net). You can also receive severe weather alerts via Twitter for Shelby County by following @shelbyalerts or sign up to receive alerts by e-mail for any metro county as they are issued from the National Weather Service. LOW LEVEL MOISTURE WILL INCREASE LATE THIS AFTERNOON AHEAD OF AN APPROACHING COLD FRONT. THIS INCREASED MOISTURE WILL GREATEST EAST OF THE MISSISSIPPI RIVER... AND WILL BE SUPPORTIVE OF HEAVY RAIN ALONG AND AHEAD OF AN EASTWARD ADVANCING COLD FRONT. BY TUESDAY MORNING... RAIN AMOUNTS OF 1 TO 3 INCHES WILL BE POSSIBLE EAST OF THE MISSISSIPPI RIVER. * PORTIONS OF NORTH MISSISSIPPI AND WEST TENNESSEE... INCLUDING THE FOLLOWING AREAS... IN NORTH MISSISSIPPI... ALCORN... BENTON...CALHOUN... CHICKASAW...COAHOMA...DESOTO... ITAWAMBA... LAFAYETTE... LEE... MARSHALL... MONROE... PANOLA... PONTOTOC... PRENTISS... QUITMAN... TALLAHATCHIE... TATE... TIPPAH... TISHOMINGO... TUNICA... UNION AND YALOBUSHA. IN WEST TENNESSEE... CARROLL... CHESTER... CROCKETT... DECATUR... DYER... FAYETTE... GIBSON... HARDEMAN... HARDIN... HAYWOOD... HENDERSON... HENRY...L AKE... LAUDERDALE... MADISON... MCNAIRY... OBION... SHELBY... TIPTON AND WEAKLEY. * 1 TO 3 INCHES OF RAINFALL POSSIBLE. * THE HEAVY RAIN MAY CAUSE FLASH FLOODING OF LOW WATER CROSSINGS... LOW LYING AREAS... AND CREEKS. A FLASH FLOOD WATCH MEANS THAT CONDITIONS MAY DEVELOP THAT LEAD TO FLASH FLOODING. FLASH FLOODING IS A VERY DANGEROUS SITUATION. YOU SHOULD MONITOR LATER FORECASTS AND BE PREPARED TO TAKE ACTION SHOULD FLASH FLOOD WARNINGS BE ISSUED. 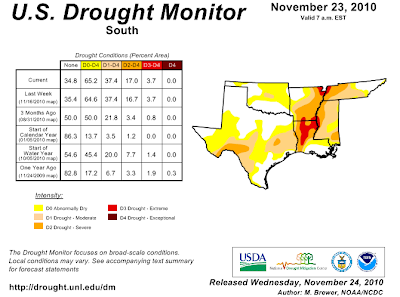 Little has been said in the past month about the drought conditions that impacted the Mid-South (and much of the south-central and southeast U.S. in fact) late this summer and into the fall months. Perhaps because the growing season has ended and we've seen more rain in the past 4 weeks or so, it's no longer a hot topic. However, the U.S. Drought Monitor still classifies the tri-state area and the Memphis metro as being in a "severe" drought in it's latest weekly release. The Mid-South area map is shown above. After only 4.50" of rain at Memphis International Airport from August 1-October 31, November has seen some welcome relief from the dry spell, with 5.39" of precipitation falling so far this month, which is above average for the month and more than we got in the previous 3 months combined. There will be one more opportunity to pad November's rainfall total, and it could be a significant one. A storm system will move out of the Rockies Sunday night and tap into moisture from the Gulf of Mexico that increases over the area into Monday. Low pressure will develop over Arkansas and further enhance the rain amounts. We could be looking at precipitation totals of 1.50-2.00" or more between noon Monday and early Tuesday morning as rain could be heavy at times. Flood Warnings are possible - even in an area classified as having "severe drought" conditions. 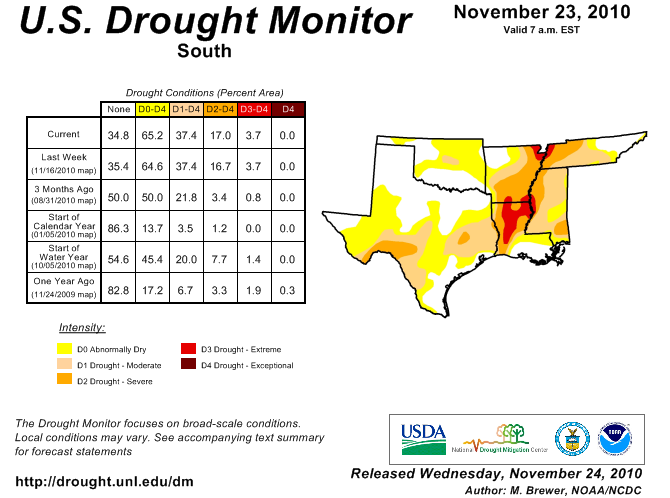 Certainly, November's rain will help as the Mid-South climbs out of the drought conditions of previous months. In the wake of thunderstorms that rumbled through yesterday along a powerful cold front, it's a good time to remember that November and early December is secondary severe weather season in the Mid-South. The best reminder of this fact though is the Thanksgiving weekend tornado that struck the city of Germantown, TN several years ago. In fact, tomorrow (November 27) marks the 16th anniversary of that destructive and deadly event in which three people from one family lost their lives while gathered for a Thanksgiving celebration at the home of Walter Person, Jr.
You can also see pictures of the event, courtesy of GFD Deputy Fire Chief Edgar Babian, here. .AN ARCTIC COLD FRONT WILL PASS THROUGH THE MIDSOUTH THURSDAY AND EARLY THURSDAY EVENING. A SHALLOW BUT MUCH COLDER AIRMASS WILL FOLLOW THE FRONT. PRECIPITATION SHOULD LAG THROUGH THE EVENING HOURS BEHIND THE FRONT... THEREFORE A TRANSITION FROM RAIN TO A MIXTURE OF SNOW AND SLEET IS EXPECTED FROM NORTHWEST TO SOUTHEAST THROUGH THE EVENING AND EARLY OVERNIGHT. ABOUT A 3 HOUR BURST OF WINTRY PRECIPITATION IS EXPECTED. DUE TO THE WARM GROUND... LITTLE IF ANY ACCUMULATIONS ARE EXPECTED IN MOST PLACES... BRIDGES AND OVERPASSES AND LESS TRAVELED ROADS MOST PRONE TO FREEZING MAY ALLOW FOR SOME ACCUMULATION. THE NATIONAL WEATHER SERVICE IN MEMPHIS HAS ISSUED A WINTER WEATHER ADVISORY FOR SNOW AND SLEET... WHICH IS IN EFFECT FROM 9 PM THURSDAY TO 3 AM CST FRIDAY. * ONLY MINOR SNOW AND SLEET ACCUMULATIONS ARE EXPECTED... HOWEVER MUCH COLDER AIR BEHIND AN ARCTIC COLD FRONT COULD FREEZE BRIDGES AND SECONDARY ROADS... ALLOWING FOR MORE ROBUST ACCUMULATION OF SNOW AND SLEET ON THOSE SURFACES. * RAIN WILL TRANSITION TO SNOW AND SLEET BETWEEN 9 PM AND MIDNIGHT THURSDAY EVENING AND GRADUALLY TAPER OFF BY 3 AM. * SECONDARY ROADS AND BRIDGES AND OVERPASSES MAY BECOME QUITE SLICK THURSDAY NIGHT. A WINTER WEATHER ADVISORY MEANS THAT PERIODS OF SNOW... SLEET... OR FREEZING RAIN WILL CAUSE TRAVEL DIFFICULTIES. BE PREPARED FOR SLIPPERY ROADS AND LIMITED VISIBILITIES... AND USE CAUTION WHILE DRIVING. I'll skip briefly through the next 36 hours... a warm front moves through early tomorrow (Wednesday) with scattered showers and a few thunderstorms during the morning, then things warm up into the 70s by afternoon and stay unseasonably warm Wednesday night with a steady (at times gusty) wind. Early Thursday, before dawn, that warm front makes one more run at the Mid-South as a cold front as it gets shoved east by a modified arctic airmass that dives south into the Mid-Mississippi Valley. The front will move through during the day on Thanksgiving, bringing with it a main course of moderate to heavy rain, a side of thunder and another of gusty north wind, and for dessert - quickly falling temperatures. The meal will be served during the afternoon hours. The overnight period is the trickiest and computer models continue to disagree like in-laws around the Thanksgiving table. As rain continues to fall during the evening, temperatures will also fall, likely reaching the 30s by midnight. Sometime around then, rain will taper off as temperatures start to reach a crucial level - the lower 30s. As of right now, it is possible that the Memphis metro area could see a little light freezing drizzle or rain, snow flurries, or light sleet for a couple of hours between midnight and about 5am Friday - or roughly during the biggest doorbuster sales of the day. I can just it see it now... but I digress. I DO NOT expect to see any accumulations of wintry mess in the metro area, but perhaps some camped-out plastic toy needers will get a boost of Christmas mood by seeing a snowflake or two. Let's not call it Black Ice Friday just yet though OK? After dawn Friday, I expect to see clouds quickly depart, leaving behind temperatures that will feel as cool as leftover turkey just removed from the refrigerator. Moderating temperatures are expected over the weekend. Have a great Thanksgiving - and stay with MemphisWeather.net for the latest. With one of the biggest travel weeks of the year coming up and plenty of celebrations planned, there is certainly more interest in the weather forecast than usual. It doesn't help that long-range forecasts to this point have been pointing towards a wet scenario and major temperature swings. 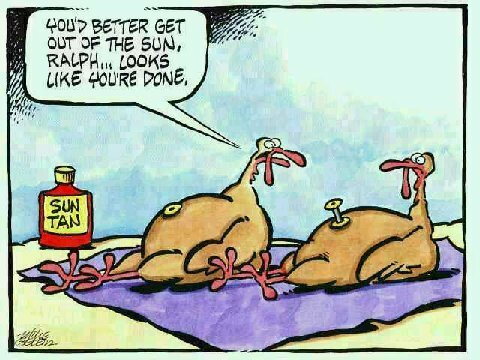 Now that the first half of the week and Thanksgiving holiday are moving into the "shorter range" of the forecast, what does the Mid-South have in store? Glad you asked... as the Facebook relationship status says, "it's complicated." Unfortunately, computer models are not doing a good job of painting a clear picture, making for less confidence in the forecast than we meteorologists typically like to see for holiday weeks. A frontal system will be making what appears to be two passes at us this week. Ahead of the front, abnormally mild conditions will continue on Monday with highs in the 70s and windy weather continuing. As the front will be closer to the region, a slight chance of a shower or thunderstorm appears in the forecast. By Monday night, that cold front approaches and then moves through the metro area on Tuesday. That will mean rain and thunderstorms will be likely during that time frame. This is where things get tricky. How far south the front moves will determine rain chances Tuesday afternoon and night. One thing is fairly clear - sometime Wednesday (probably early), that front will return as a warm front as low pressure developing to the west drags the front back north. This puts the Mid-South back in the "warm sector" with more scattered showers and thunderstorms possible Wednesday - one of the biggest travel days of the year. Up until today, I had forecast the front to finally move all the way through the region by Wednesday night, bringing in much cooler weather, but ending the rain chances by Thanksgiving. Now I am much less convinced and am hedging towards the front making it's last move through the region on Thanksgiving Day, accompanied by the potential for rain and thunderstorms, some of which could be heavy as a strong surge of Canadian air pushes in behind the front. There is still plenty of time for things to change, but as of now that is my best forecast. This will delay the very cold air, so Thanksgiving Day may not be as chilly as previously thought, but Black Friday could be the coldest day of the fall to this point with highs in the 40s. Moderation in temperatures is expected next weekend and behind this front I expect the weekend itself to be dry. Stay tuned into the MemphisWeather.net forecast for the latest in expected conditions for Thanksgiving week. I'll also be posting updates on Facebook and Twitter throughout the week. NOVEMBER 15TH THROUGH 19TH IS WINTER WEATHER AWARENESS WEEK IN THE MID SOUTH. PEOPLE ARE ASKED TO TAKE SOME TIME AND PREPARE FOR THE UPCOMING WINTER SEASON. TODAYS TOPIC IS WINTER WEATHER SAFETY RULES FOR YOUR HOME. THE BEST WAY TO SURVIVE A WINTER STORM IS TO PLAN AND PREPARE FOR THE HAZARDS OF WINTER WEATHER. ALTHOUGH SOME WINTER STORMS DEVELOP QUICKLY AND WITH SHORT NOTICE... MOST EVENTS CAN BE PLANNED FOR. IF POWER IS LOST... NEVER USE A GASOLINE OR DIESEL POWERED GENERATOR INSIDE THE HOUSE... IN THE GARAGE... OR ANY OTHER ENCLOSED SPACE. GENERATORS CAN CAUSE CARBON MONOXIDE TO BUILD UP TO DEADLY LEVELS IN ENCLOSED SPACES. OPERATE SUCH GENERATORS OUTDOORS ONLY. ANOTHER WINTER THREAT IS HOUSE FIRES. DECEMBER... JANUARY... AND FEBRUARY ARE THE LEADING MONTHS FOR HOUSE FIRES IN THIS COUNTRY. MORE THAN ONE-THIRD OF FIRE DEATHS TYPICALLY OCCUR DURING THE WINTER MONTHS. ORDER. THIS INCLUDES REGULAR INSPECTIONS. THE UNIT OFF IF IT TIPS OVER. AND ONLY WOOD SHOULD BE BURNED. SHOULD NEVER BE USED FOR HEATING. CHARCOAL GRILLS... AND WOOD-BURNING FURNACES AND FIREPLACES. EARLY WARNING WHEN THE GAS BEGINS TO BUILD UP.